One of the best parts about reading is that it can transport someone to a different world. By just reading a few pages, a reader can visit mythical kingdoms, travel hundreds of years into the future, or experience things beyond the normal imagination. At one DeKalb County School District (DCSD) high school, reading also brought readers a tasty dessert. 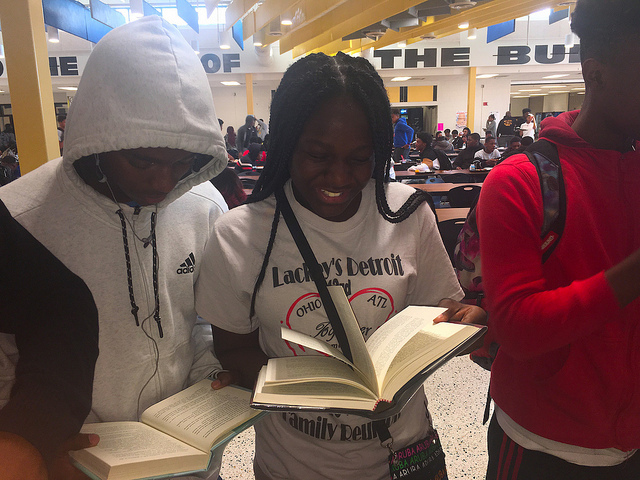 Lithonia High School wrapped up the calendar year 2018 with a Let’s Read campaign, designed to garner interest in one of the school’s best assets: the library. 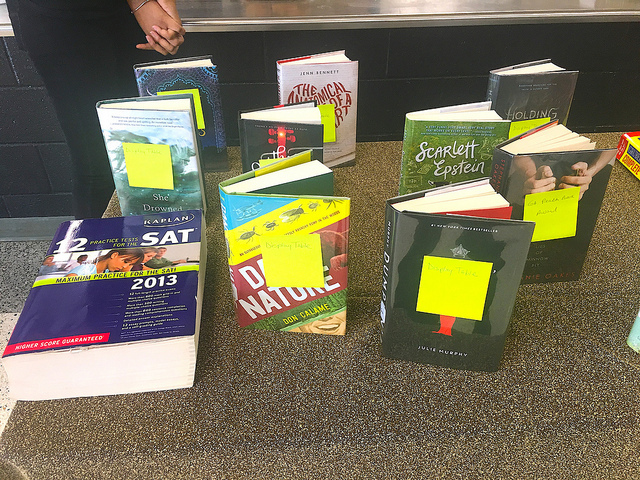 The event, made possible by community partnerships with Kroger and Publix, included showcasing new titles, information about the library, and rewards in the form of pies, cakes, cookies, and more. The event was stealthily coordinated, according to Mayfield. She was able to pull it off without a hitch with the help of colleagues Betty Beasly, Samuel Marion, Jessie Welcher, Sarah Lee and Robin Lloyd; as well as students NaCala Wiber, Camya Baker, Ciara Pass, Shakira Salmon, Jasmine William and Travis Daniel. A collection of books were set up on tables during school lunch periods. A smooth jazz composition played in the background to draw students’ attention. Mayfield and a few volunteer students greeted people as they approached, and asked them questions. For every correct answer, a dessert was awarded. She credits the event as the product of a vision cast by Principal Darrick McCray. He has hosted contemporary young adult authors such as Jason Reynolds, and wishes to revert Lithonia High’s library to the epicenter of learning on campus. In making the Lithonia High library the center of learning, McCray hopes to improve reading and literacy scores across the board. Dr. Mayfield agrees with McCray’s assessment. In a world now dominated by connectivity and technology, students tend to dismiss the library as a room just filled with books. Little do they know, she said, that it’s so much more. According to Mayfield, students can use the library as a research center with a web-based catalog, an access point to Georgia state library, a resource center filled with test prep materials, and more. Mayfield hopes to show students other resources in the library, such as technology available through Lithonia. She also hopes students realize the joys that come with cozying up to a good book. A second reading campaign is tentatively scheduled for Spring 2019 in late March. Until then, Mayfield and other school staff will continue to do what they can to usher students into the library.